FTEP | Mainline Conveyor Systems, Inc. The powered fork truck entry is a standard three finger fork truck entry in which each finger includes powered rollers to drive the load. Outwardly this device appears much the same as a standard nonpowered forktruck entry. 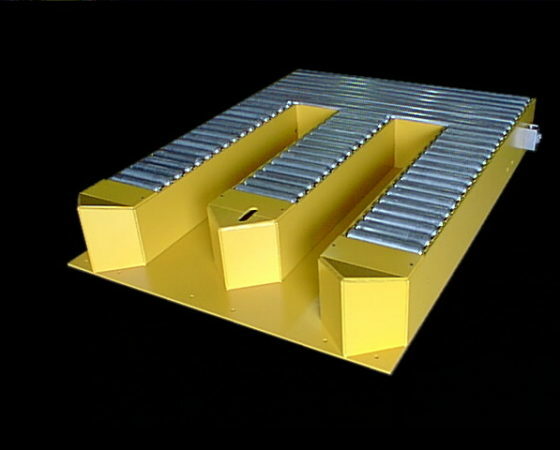 The unit is 12″ TOR in height and is fabricated from 3/8″ steel plates. The fingers are all welded to a common base plate that can be provided with a straight or bent edge for installation in a similar fashion as the nonpowered units. The overall length of the unit is extended from the standard 5′ nonpowered FTE to 7′. The additional 24″ long, full width section, houses the common conveyor drive. This device is provided as a standalone unit. Each finger is a belt driven live roller conveyor and all are powered from a common drive. The common conveyor drive includes a single gearmotor and common drive shaft with multiple belt drive pulleys mounted to it. Each pulley in turn pulls a belt through pressure racks mounted in each finger to drive the load carrying rollers.